PARiM is offering different options for contacting and notifying your people. You are able to reach them via email, message or SMS. You can message people from the Schedule calendar as well as from the People page. The Schedule page is useful when you need to message either all or specific persons regarding anything scheduling or shift related whereas messaging from the People is great for HR purposes, for example, you can filter out all the people whose passports have expired and can email them about it. Here you can find a video tutorial on how to send messages and emails with PARiM. Allows you to send a general message to all currently active people. 2. A messaging window opens where all active persons are included in the recipients' list. Next, write the message, tick the email and/or SMS option and click 'Send'. 1. Use the filters on the left-hand side to find relevant persons. For example, to message all persons that are working on a specific site use the Site filter and the people list will only show the preferred persons for that site. 2. Find the 'Publish & Send' button on the top right-hand corner, click on the arrow next to it and choose 'Message visible people'. This means that only the persons who are currently showing on the people list will be included as recipients to the message. 3. Write a message, choose whether you want to send the message as email and/or SMS and click 'Send'. 1. Click on the 'New message' button on the top right-hand corner. A messaging section appears where you will need to click '+New' to create a new message. 2. Next, click on the persons´ names to include them to the Recipients list on the right-hand side. 3. Write a message and click 'Send'. 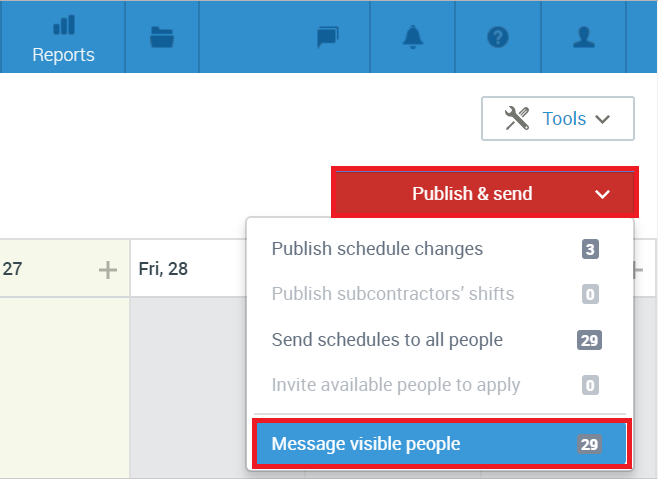 After you have created open shifts, then you can invite people to apply using messaging functionality. The system will send the message only to the people who meet all the set system settings - like person must be available during open shifts, person must have the position assigned to them etc. Please find step by step guide HERE. This is useful when you need to message people about their details, visas or documents that need updating, all HR related. You can firstly use the filters on the left-hand side to find the people that you will need to contact, then select them all and a message option will appear on top of the list. If you notice something that needs persons' attention you can message them directly on the People page. This can be done on the People page - simply find the person on the list and click on their email address to send a message. Either tick the persons' names OR use the filters to find the persons you need to contact. Next, select the persons and the Message option will appear at the top of the list. Click on it, write the message and click 'Send'.